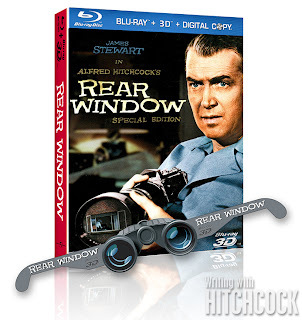 Mock up of the bogus 3D Blu-ray packaging complete with Rear Window binocular cut-out glasses included. In 1953 while under contract to Warner Bros., Alfred Hitchcock embarked on a screen adaptation of Frederick Knott's stage hit Dial M for Murder. At the same time that he was preparing to film his Warner picture, he began planning Rear Window for Paramount. Both films would be technically challenging for Hitchcock and his production team—the former largely because it was to be filmed in the fad of the day, 3D. It is interesting to speculate on what was going through Hitchcock's mind at the time. 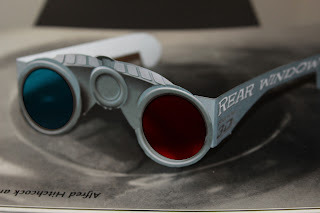 No doubt he knew that Rear Window was going to be much more of a visual tour-de-force, so I posed the question, could it be possible that Hitchcock actually filmed Dial M for Murder in 3D merely to get his feet wet before embarking on the much more challenging film? While we know this was absolutely not the case, as an April Fool's gag this year I put together a video for some friends and colleagues with the premise that Hitchcock had at one time intended to film Rear Window in 3D but then abadoned the idea. 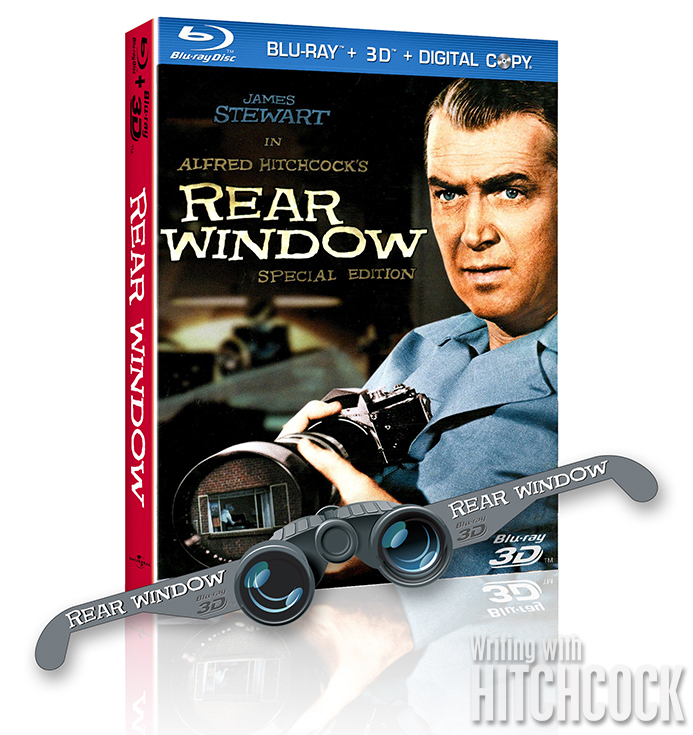 But now, with Hitchcock's "true" intentions uncovered, a dimensionalized version of Rear Window was in the works. Thankfully, this was not the case...but it almost seemed a plausible idea—plausible enough to get some interesting reactions from friends, and to cause some chatter among a few HD video enthusiasts. 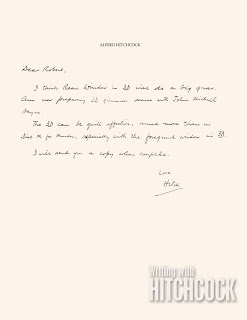 The fabricated letter in Hitchcock's actual handwriting was simply assembled from snippets of correspondence reproduced in Dan Auiler's Hitchcock's Notebooks. 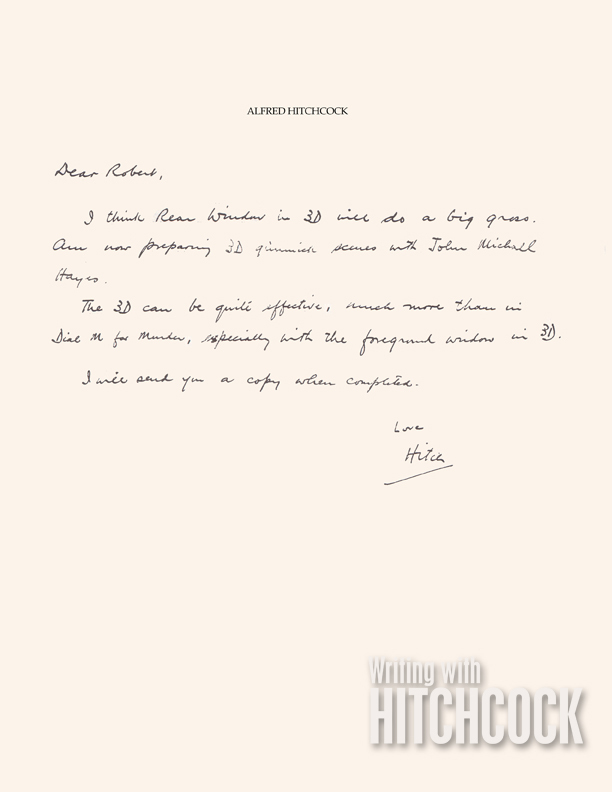 To help sell the idea in the video—which was to take the form of a making-of featurette—I created a letter from Hitchcock to his director of photography Robert Burks using Hitchcock's actual handwriting and merely rearranging key phrases and words to suit the story. I then created some graphics to illustrate the process that was involved in adding dimension to the 2D movie, and finally "dimensionalized" a handful of shots from Rear Window in After Effects. If you've got a 3D monitor and glasses handy, you'll be able to see some 3D footage within the video that starts at 4:19. Set the 3D mode to "Interleaved." Enjoy! Below is the flat version of the video in case you're unable to view it in 3D. Another mock-up of the binocular glasses with cyan and red lenses.